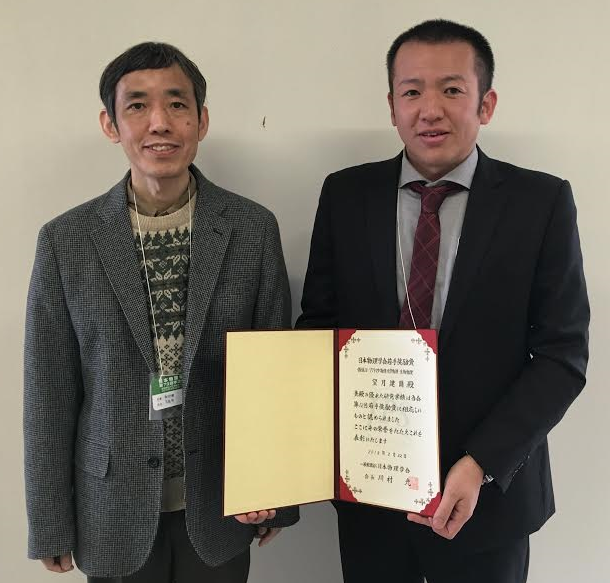 Assistant Professor Kenji Mochizuki of the Institute for Fiber Engineering received the Young Scientist Award of the Physical Society of Japan (Division 12: Soft Matter Physics, Chemical Physics, Biophysics) and gave an award lecture at the 2018 annual (73rd) meeting held at the Noda Campus of Tokyo University of Science from March 22 to 25. In the division 12, 3 researchers won the prize among the 8 nominees. The award winning title was “Studies on the Phase Transition of Water”. Research Outline: Dr. Mochizuki has been engaged in research to reveal phase transition and critical phenomena of water and ice at the molecular level by combining molecular dynamics simulations and theoretical chemistry methods. In the research topics, he elucidated the molecular mechanism of spontaneous collapse and formation of complex hydrogen-bond network in homogeneous ice melting. In a recent paper, he also suggests the existence of the solid−liquid critical point for water in a quasi one-dimensional space confined in carbon nanotubes and elucidate the molecular mechanism of influence of cononsolvency on stimuli-responsive polymer. These studies were appreciated for highly originality and the ripple effect on other fields.